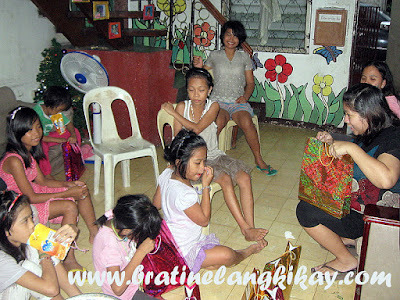 It was again time to visit my favorite orphanage and share our blessings with the less fortunate kids of Tahanan ng Pagmamahal. 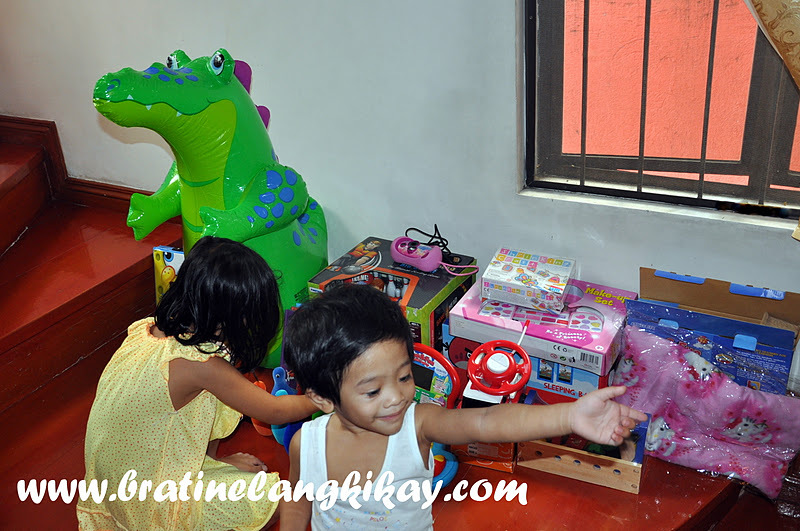 This was already my colleagues and I's 3rd straight year of giving joy to the children (ages 3 to 15) at this shelter for wounded, orphaned, abused and abandoned children. This is a very small shelter, housing only 18 children (latest this year, but last year there were only 12 kids) and receives no financial support from the government. They sustain the kids purely through the kindness of private donors and individuals. 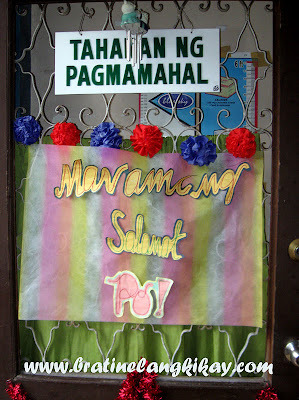 This is the reason why I choose to go back here every year as I feel my efforts, even small, will make a greater impact. We even had my little boy's 1st birthday at this orphanage. I am thankful for the support of my boss in Australia for our cause. 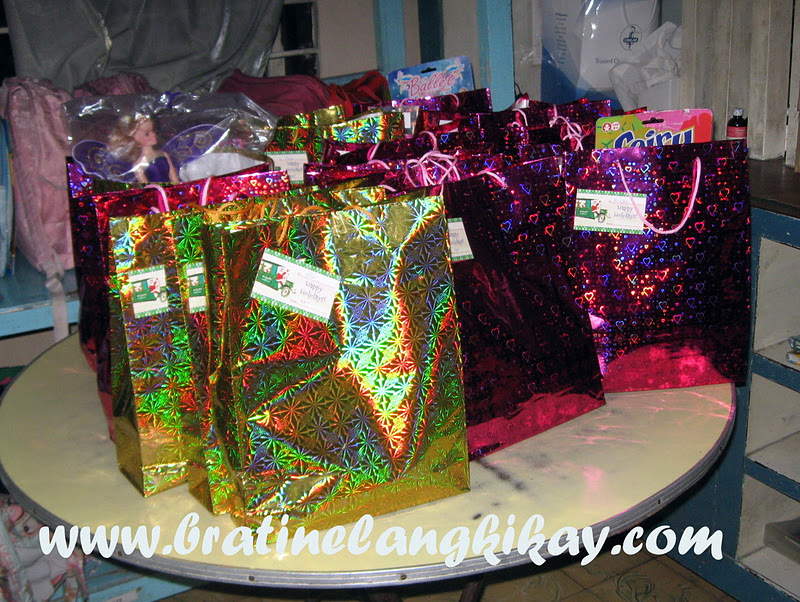 Last year, they matched our donation for the children and we were able to give more than what we expected. This year, our company, through the kind heart of the owner, Alec To, will be donating a brand new computer for the children. We didn't have a formal program. Normally when we visit, we just mingle with the kids and try to interact with them as much as we can. It was great that they remember me by my name, since I've been visiting a couple of times already. I like the fact too, that we (my colleague Liezel and I) already know the faces against the names and the sad story why they are not with their parents. It makes our interaction with them more natural and spontaneous. 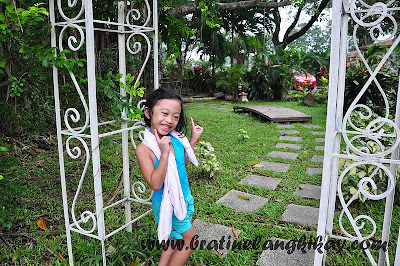 Mutya - the youngest child at the shelter. She's only 3 years old. The kids danced and sang for us which really warmed our hearts. During the 'welcoming ceremony' where they introduced themselves one by one, some of them were very shy and almost teary-eyed when they recited their names and what they want to be when they grow up. But during the dance presentation, all the meekness and shyness somehow flew away. Even the special children (those with disabilities) participated. 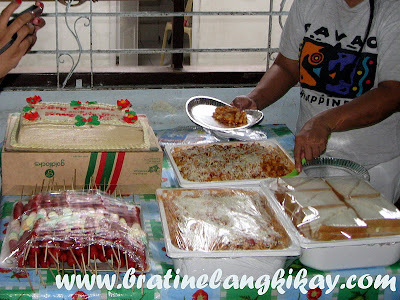 We cooked a simple merienda of baked macaroni, egg salad sandwich, hotdog on stick and bought cake at Goldilocks - staple food in every children's party. We didn't want to spend a lot on the meals (opted to cook instead of ordering from Jollibee) so we can give more grocery items for them. 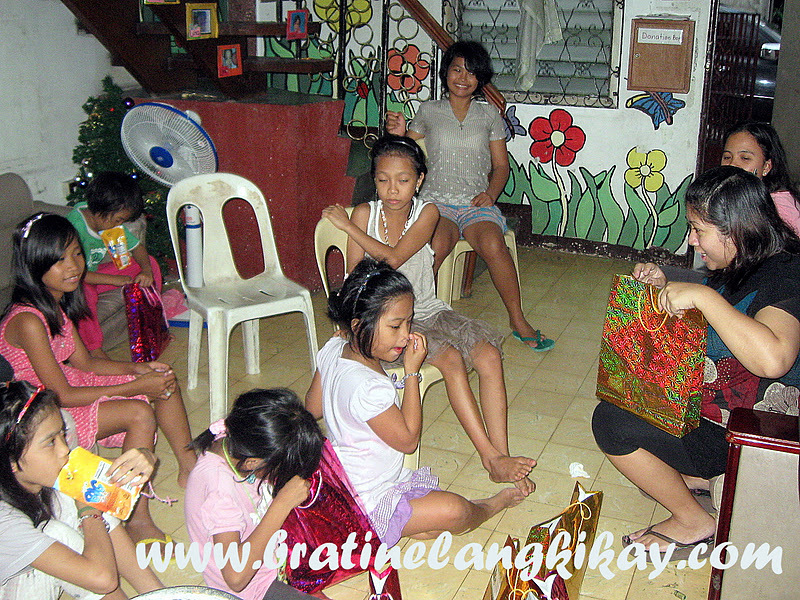 Aside from the groceries and other basic necessities we bought for them, we prepared individual gifts for each child. It contained various goodies they need in school and for their hygiene like underwears, socks, and slippers. We also threw in some chocolates and biscuits and dolls for the younger ones. 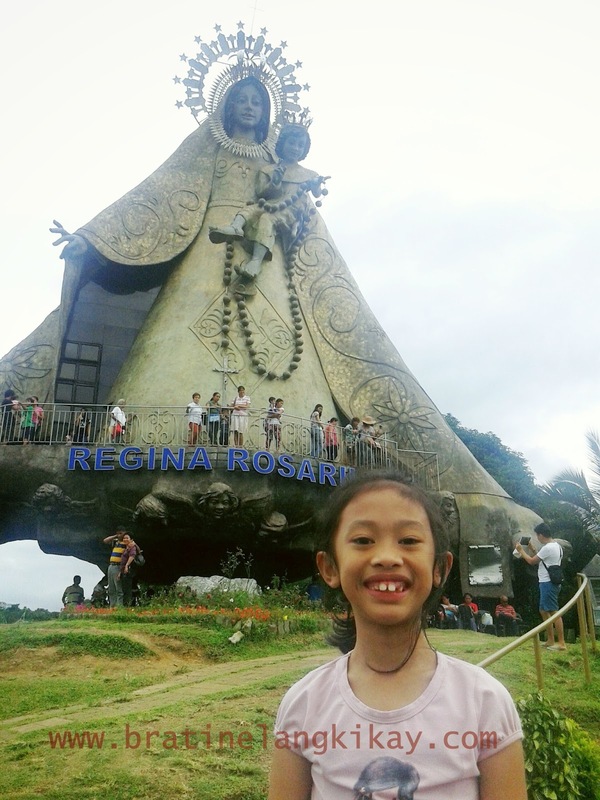 Like our previous visits, this one made us appreciate the life that we have and the blessings we have been given no matter how small they were. Personally, I feel lucky to be have been born to a set of responsible parents who raised me to what I am today, who provided me not only with shelter, food and education but all the affection and care one could ever hope for. A few days ago before Christmas, one of my friends posted in Facebook how dry she's been feeling about the holiday season. Honestly, I feel the same 'lack of vigor' for the Christmas season. The absence of a family member always bring a tinge of sadness in every occasion, and Christmas being the happiest time of the year especially for Filipinos, makes the longing even stronger. I am again missing my Dad and also my Lola, who both made Christmases extra memorable in their many unique ways. Also, it was our first time in 10 years since The Hubby and I tied the knot that my parents-in-law didn't make it home for the holidays. My father-in-law is sick and undergoing chemotherapy, thus, traveling overseas is out of the question. My Darling Sister too, is under tremendous stress due to her very difficult pregnancy and she and husband are literally living by the day, dreadfully awaiting what seem to be the inevitable loss of their third child. We believe and continuously pray for a miracle, after all, being without any amniotic fluid for almost two weeks and the fetus still fights with a strong heartbeat is already a miracle itself. I also lost a friend three days before Christmas. I was supposed to meet her for cake and coffee on the 22nd and received the bad news that she had passed away on the exact same time we agreed to meet. I was shocked and saddened, especially that she died of a simple, highly treatable urinary track infection. She left three young children, ages 3, 11 and 15. However, being a mom, I need to shun my negative emotions and focus on the reason for the season. This is the time to be thankful for what we have received throughout the year and the many blessings that we pray to come ahead. The fact that my children are sooo looking forward to Christmas is enough for me to try and make it as memorable for them as possible. 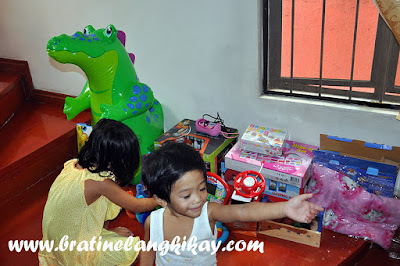 My daughter asked me a couple of weeks ago, "Mommy, why is it that we give gifts during Christmas? Is it someone's birthday?". The innocence of her question made me smile but reflect at the same time. True, Christmas has become very commercialized these days that we value it more for the presents we receive rather than its meaning - the birth of Jesus, our Savior. 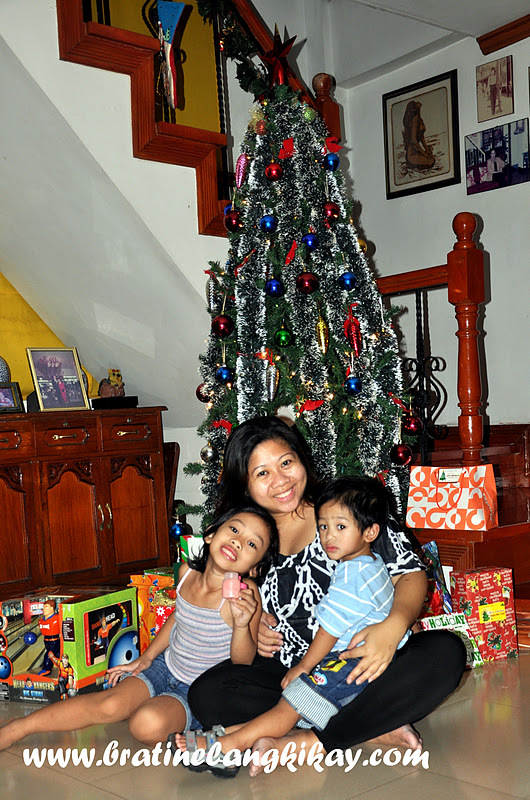 Indeed, this Christmas is an extra ordinary one for our family. It may seem one for the simplest, less festive compared to the previous ones, but still we should not forget that this is not for us adults - it is for Jesus and it is for the children. 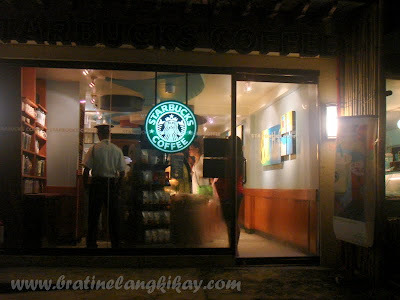 I don’t remember anymore when I last attended Simbang Gabi, a nine-day early morning mass in preparation for Christmas. 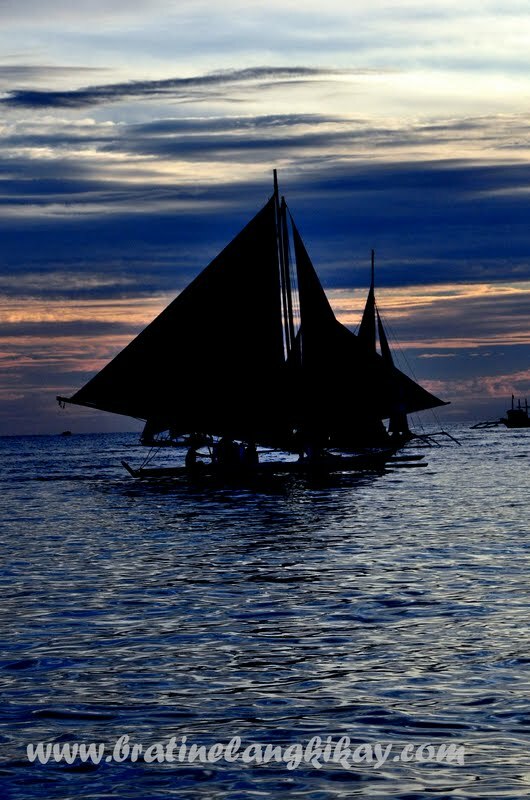 It starts on the early morning (usually at 4am) of 16th December and ends on the eve of Christmas (Misa De Gallo), 24th December before the traditional Noche Buena. Many believed when one is able to complete all nine masses, he/she can make a wish and that will surely be granted. So when I was in my early teens, peer pressure and this promise of a 'wish come true' enabled me to wake up at ungodly hours in the morning and attend the mass. With eyes half-closed, we'd walk from our house to Lourdes Church, about 5 blocks away. I couldn't even remember what transpired during the whole celebration nor what the Gospel said - needless to say, I, my friends and cousins were all busy chitchatting the hour away. All we wanted was to complete the 9 mornings for our fervent Christmas wish to be granted. Anyway, my retrospection made me realize how some people do things without even knowing why they are doing it. It made me wonder how many of those who went to church this morning really wanted to hear mass while everyone snores. My guess, maybe only half, and I am already being optimistic. Most of the time, it's the youth (teens) who does the ritual with eagerness. 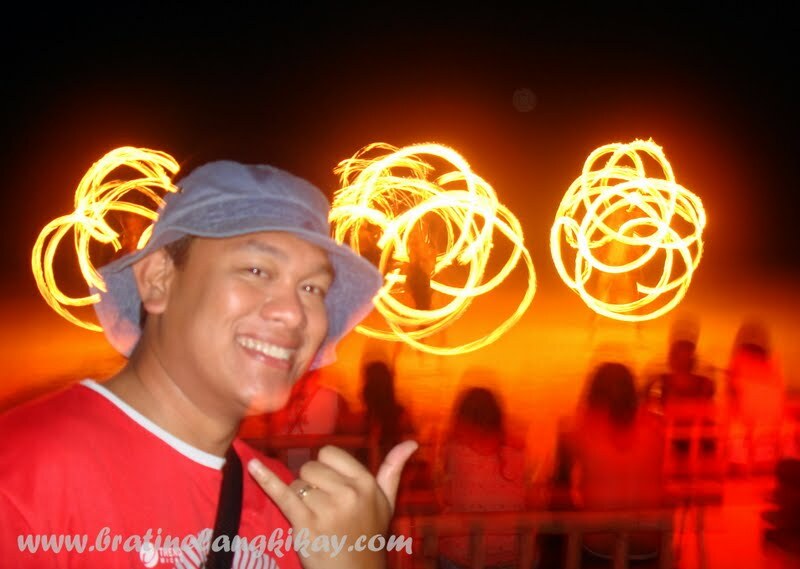 And sadly, we see them in pairs and use Simbang Gabi as an opportune time to date. Simbang Gabi is a Filipino Christmas tradition that I hope will be passed on to the many generations ahead. But I wish the purpose and meaning of this practice is understood and embraced by everyone who choose to make the morning sacrifice for nine straight days. I wish my wish will come true without me going to Simbang Gabi. One of the skills I never thought I would acquire is the ability to do arts and crafts. Since I was a child, I was never good in Art and the most creative I have ever been was when I put a ruffled skirt over my head and pretended I have long hair. During my school years, the highest grade I ever got in school projects was 85. I struggled in our Home Economics class, barely passed sewing and burned by finger with a glue gun. But now that I am a mother of three and with a grade-schooler, I find myself 'creating' all sorts of stuff quite often. In fact, over the last 3 years since Eone started schooling, I've made head dresses, various costumes and outfits made of whatnots. I've also learned balloon decorating for my son's first birthday, whipped up e-cards and invitations for their birthdays and many more! I sometimes look at my work, almost saying in disbelief, "Really? I did this?". 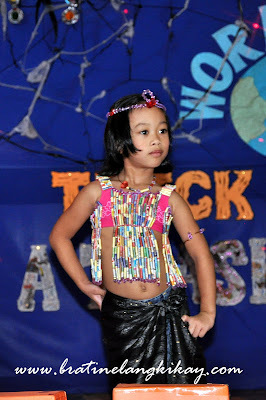 In fact, I did say that just now when I inspected Eone's costume for their school's Trashion Show. Their school, in celebration of United Nations' Day and in support for saving mother Earth, came up with this fashion show event where pre-schoolers will model costumes of their chosen country. The costume must be made of recycled materials hence the title. So I made Eone something to make her look like Cleopatra as she wants to represent Egypt. I made paper beads from pages of our telephone directory and sewed them on her old swimsuit top. I thought it's going to be pretty easy but I found myself rolling strips of paper in the middle of the night and sewing even while having dinner. Even if I want to, I just wouldn't be able to finish a skirt made of paper beads so I decided to just make her wear one of my shawls as wrap around skirt. Modern Egypt nalang! For her accessories, I simply twisted copper wires I bought from the hardware and adorned them with old beads I've been keeping in an old jar for many years. The best consolation was watching my baby confidently walk around the stage, proudly modelling her MomGyver's work. I've been waiting for the time to come when my kids have learned to read and write. I've been looking forward to receiving hand-made Mother's Day card or letters from them, especially Eone now that she's already in school. That momentous day actually have come. 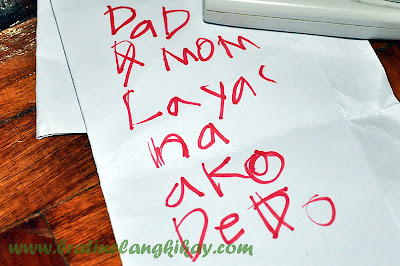 I am proud that at age 5, my little girl can now read and write both in Filipino and English, sometimes slow but still it's a great progress. Last week, she was asking me to help her craft a flag of China for her United Nations Day in school. I told her I want to rest first and we'll do it later. She was unhappy about my procrastination and her 'maldita' side emerged. I kept ignoring her and to my relief, she stopped pestering me. Few moments later, she handed me a pink folded art paper. 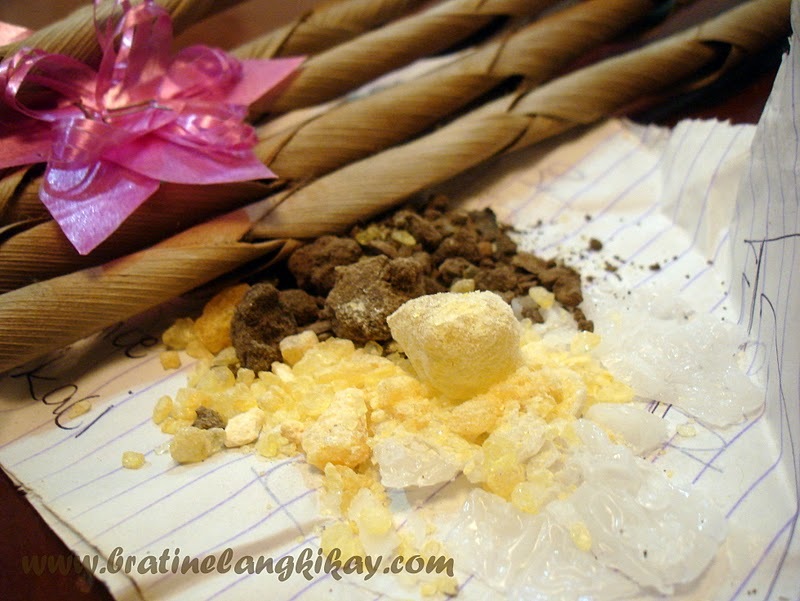 Between the folds was a bond paper. She said, "I have a letter for you, Mommy". I got excited and opened immediately. loosely translated: Mom & Dad, I am getting out of this house! Should I laugh or cry? Actually, I did the latter (but my mom said I shouldn't). Isn't she sweet, wanting to leave me and her dad a letter before running away? Haha! We trooped to Clarkfield, Pampanga last weekend, just after typhoon Quiel left the country with Bulacan and Pampanga submerged into flood water. It was still gloomy with some shots of sunshine here and there, but our itchy feet prevailed. Like most of our out of town weekend trips, this one was unplanned. We were attending Sunday mass and The Hubby asked what's the activity for the day. I casually said I want to go to Clark and check the duty free malls for Aveeno lotions (yeah, I go that far for a lotion!). To my surprise, The Hubby said we'll go and soon after we dressed the kids, we were traversing NLEX on our way to Pampanga. We passed through Candaba Viaduct, a 5-kilometer bridge over the Candaba swamps and considered one of the longest bridges in the Philippines. We often refer to the bridge as Itlog-Ebun bridge because it starts in Pulilan, Bulacan where egg is called itlog and ends in Pampanga where egg is referred to as ebun (bird) - you start your journey with an egg and arrive with a bird. It's something I hate to see, especially I have friends who live in Bulacan. 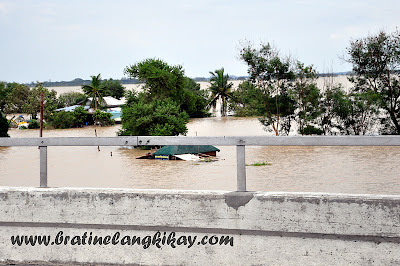 It also reminds me of typhoon Ondoy which also submerged a lot of areas in Metro Manila and Rizal in flood water. Anyway, we reached Clarkfield after lunch. 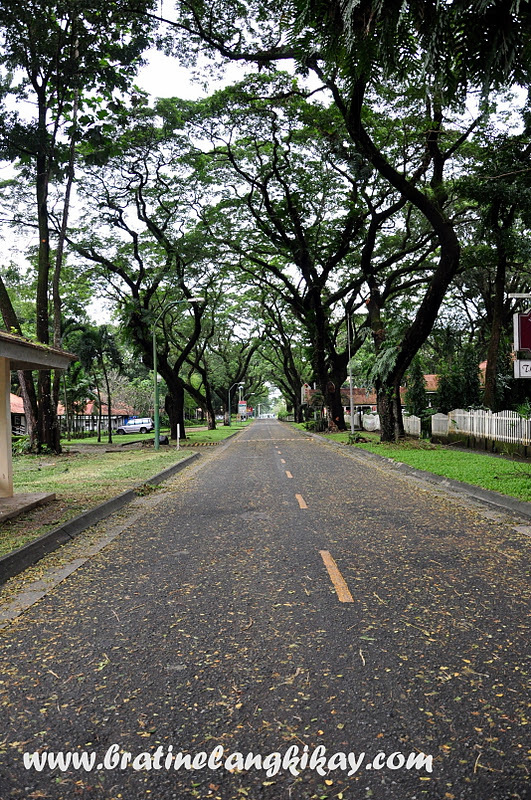 We went for a short walk inside Mimosa Estate, looking for a place to eat. 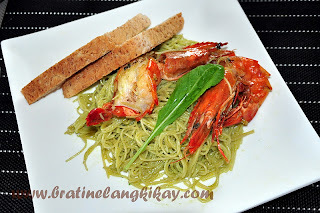 The Hubby wants to eat at Red Crab but when we got there, we learned it won't be open until 6pm. So we settled at Cafe Mesa, just beside Red Crab. It's the only resto open at that time. We've tried this resto 3 years ago, and more than the food we like the garden better. 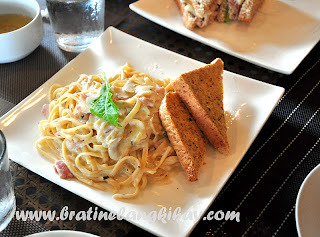 We ordered mainly sandwiches and pasta - simple food, a bit expensive at Cafe Mesa but the serving is hefty and the food is actually delish. We went to El Kabayo after eating in the hope that the kids can go horseback riding. Unfortunately, it started to rain as soon as we parked so despite Eone's plea (and tears), we headed to the duty free shops earlier than expected. Early means more time to browse. More time means more shopping. Ayayay! A lot of friends and relatives have asked me why do I blog and where do I get all the things I write about. Honestly, I don't know. But what I am sure of is that I like love to write. Although I know I am not as good as a Jessica Zafra or a Kahlil Gibran, writing is something I truly enjoy and happy to do. I could not remember when it all began but I know it was through a diary, yes like a Dear Diary, which I started when I was 12 and kept writing my daily thoughts 'til I was in my 20s, before blogging became popular. Aside from that my love for writing was enhanced when my Dad started working overseas and we had to write him letters. Back then there was no internet yet, and the telephone is the only other means to communicate aside from snail mail. Every week my mom would ask my sisters and I to write a letter to my Dad, detailing how our week went and our activities in school. And write we did, with zest and eagerness (because we don’t want to do a voicemail - recording our voices on tape. We felt silly talking in front of a cassette recorder). After a year or so of writing to my Dad, our whole family was granted a resident visa to Jeddah and off we went. Our letter writing didn't stop there as we now had to write letters to our relatives back home and also to select friends we left behind. I also had a semi-boyfriend then whose letters I replied once or twice. Who didn't know that Saudi doesn't have any theaters and clubs and that TV shows are monitored and go through rigid censorship? Even cartoons are being censored. Without any decent channel to watch, my sisters and I turned to reading which I believe started our love affair with books and eventually expanded our vocabulary. 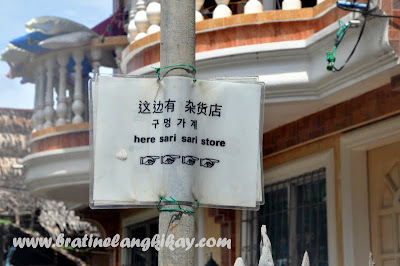 We read all sorts of novels we had access to; those left behind by expats who resigned were taken to a huge gym and billiard hall of the condo building. That's how mainly we spent our days in Jeddah (aside from shopping and watching New Kids on the Block concerts in betamax). When I went to college, I 'unintentionally' joined the college publication (The Thomasian Engineer or TE). It was my best friend who wanted to join and I accompanied her to the 'qualifying exams' where aspirants are made to write various articles and essays on the spot. One staffer asked me to take it too since I was already there. I did and topped the test. My bff didn't make it. 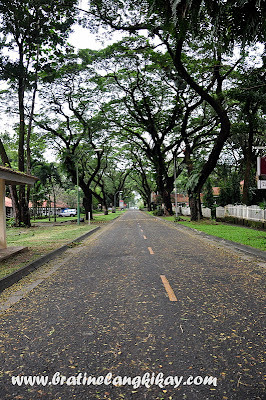 Anyway, the college paper served as my practice field in writing (and eventually blogging) although aside from writing for the paper, I love the people I worked with more than anything in school back then. The best thing that happened to me in joining TE was the friends for life that I gained. I wouldn't have survived the 5 grueling years of engineering if not for them. I think that's worthy of a separate blog. While writing for the college paper, our advisers often told us that joining TE was more than just writing but a preparation for us when we join the 'real world'. I never understood what they meant until I graduated and started working as Methods Analyst for a bank. Aside from the fact that my job involved studying systems and procedures, I also had to write them. Jeez, and that was a lot of writing. My next jobs all came with having to write procedures, training materials, or quality and productivity reports. And even though internet is now available and access to free essays and documents is as easy as brushing my teeth, I am proud to say I didn't need to resort to that. And thank God I was never one of those supervisors who issue memos and their subordinates laugh at their grammar and sentence construction. Currently, my role at work doesn't necessitate for me to write at length except for dramatic emails when I had to argue my point across. So I blog. 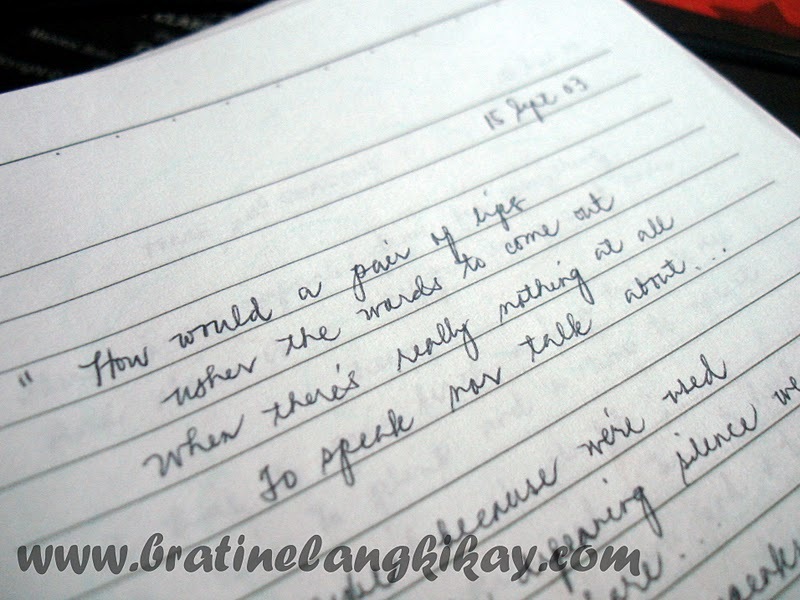 I blog about what I see, what I hear, what makes me happy, irate and sad. I write about my kids and their antics. I jot down the food that I eat, places I visit, people I meet. It's a great way to document what and where I am now. I love writing and with blogging (and my old diaries) I am certain nobody else needs to write my biography. To this date there is only one brand of cookies that I'd won't mind paying an arm and a limb for. That's Famous Amos. 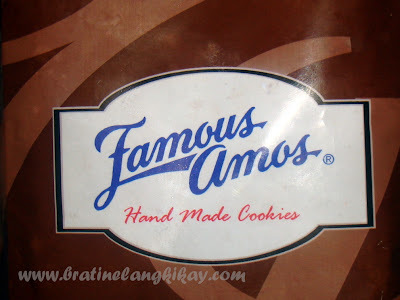 Famous Amos started as home-baked cookies meant to be given as gifts to celebrities by Wally Amos, a talent agent. Amos opened his first store in 1975 in Los Angeles and became an instant success. 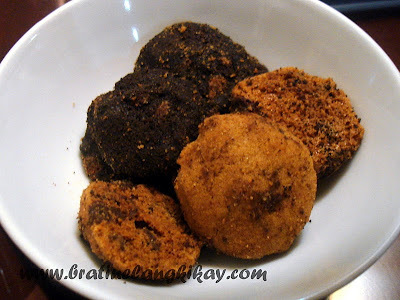 I was first introduced to this heavenly delicious, crunchy and freshly baked cookies on my first trip to Singapore in 2007. There was a small Famous Amos store in Marina Square near the exit going to Ritz Carlton where I was staying at that time. Although I find the prices expensive than Mrs. Fields, I gave it a try and bought 200g of Double Chocolate Chips with Pecan Nuts cookies. I took my first bite and there was no turning back. I got hooked, so hooked that I once bought all 8 varieties of cookies and over the wekend ate nothing but Famous Amos. Over the last couple of years from traveling to SG, I made it a 'habit' to bring home these cookies as pasalubong to Eone who also share the same fondness for the chocolate chip flavor. I have found packed Famous Amos cookies in Rustan's once but the taste didn't come close to the freshly-baked ones. So technically, there are only 2 ways to get my cookie fix and they are through friends who occasionally come home from Singapore (or I go there) and through my in-laws who live in Hong Kong. Which reminds me, we are going to Hong Kong end of October and I need to make sure we go to The Peak because there is a Famous Amos outlet there. Don't you girls hate it when you go to a restaurant or cafe and struggle for a place to put your bag, thus, it ends up on your lap the whole time? Or go to church and have your bag sit on the floor? I went through that dilemma for a long time until I purchased a handbag hook from CMG. 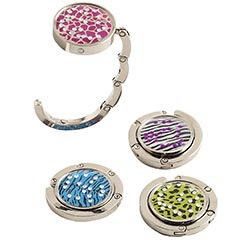 Handbag hooks or purse hangers are very useful accessories for any woman, especially those who strut around carrying a purse all the time. For me, aside from being fashionable and chic, it gives me a better sense of security that my bag is hanging very close to me instead of at the back of a chair where it can be easily spotted by pick-pockets or snatchers. Bag hooks comes in various shapes and designs and prices vary from shop to shop. 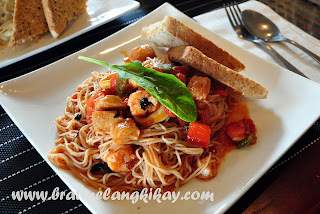 At CMG, the cheapest is at Php299. It's been a while since my little princess and I did our artsy stuff together. 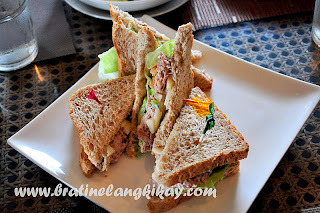 I've been busy with work and she with school (o-ha) and a lot of everything else in between that we've missed our usual bonding sessions in the form of cooking or craft-making. I've been wanting to try making my own chocolate lollipops instead of ordering or buying. From various reading materials I came across with, the process is fairly simple - melt and mold. In fact, walking to the mall to buy the ingredients was the hardest part, hahaha. I bought all my ingredients from Cooks Exchange; it's located at Megamall so the prices are a bit higher compared to getting your supplies from Chocolate Lovers. Eone and I melted using an improvised double broiler the white chocolate block I bought from Cooks Exchange, mixed it with red food coloring powder (to achieve the pink color) and poured over our molds. After letting it cool for about 5 minutes, we placed the molds in the freezer for another 5 minutes to set the chocolates. 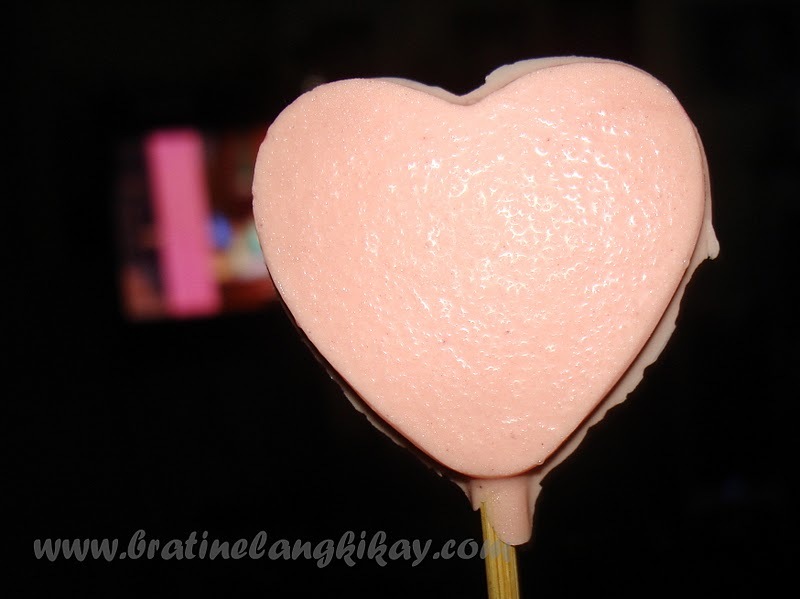 The kids loved the outcome, especially Eone who helped me create the chocolate hearts. She must have realized how easy it was to make it because she's now insisting that I do more and we can put up a store to sell it. How enterprising! Yesterday, she told me she promised her classmates that "Mommy will make chocolate lollipops for all of us!". I've had my share of skin problems, specifically pimples, when I was a teenager. It wasn't very bad like my face was all red with pustule and you couldn't see a clear spot anymore, but rather occasional outbreaks and one or two big zits that took days to heal. Thankfully, when I entered college my skin cleared up, I enjoyed many years of clear skin bliss and got hooked in make up and beauty products. So imagine my frustration when I got preggy with my son and my skin took the beating of pregnancy-related outbreaks. I had acne (although moderate), dry skin on my chin, and oily patches on my nose and forehead. 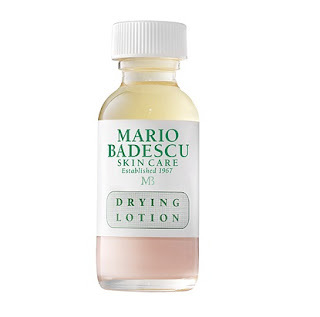 I've tried many skin care products before but the one I trust best is Mario Badescu. Prior to pregnancy, I was already a user and fan of Mario Badescu Skin Care products. I'm an avid fan of their Seaweed Cleansing Soap and I love the supple feel of my skin after using it. Mario Badescu is more popular for their acne management products and I wasted no time in ordering their popular Drying Lotion online. In the Philippines, only Rustan's sell Mario Badescu products (at a premium price compared to the US) so even if I had to wait for a gracious friend to send a box to Manila from the US, I'd rather order online. 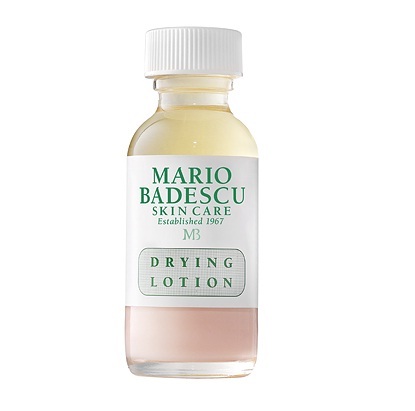 Mario Badescu's Drying Lotion delivers exactly what it promises - a dry and healed pimple after applying the solution overnight. It's amazingly effective and works like magic. Benefits: The Drying Lotion is a fast acting, effective acne spot treatment. Formulated with salicylic acid, calamine and other quick-drying ingredients, this product will shrink ugly whiteheads virtually overnight while you sleep. While other acne spot treatments can irritate and dry delicate or sensitive skin, this product is safe and effective for all skin types. How to Use: Before bed, after cleansing, toning and moisturizing apply a dab of lotion directly on the whitehead using a cotton swab. Do not rub in. Let it dry and rinse off in the morning. DO NOT shake the bottle and apply only the pink sediment on the skin. Beauty Tip: Great for back acne and breakouts on the chest. The Drying Lotion will also take the itch out of mosquito bites fast! If you order online, the 1oz bottle is priced at US$17.00 plus shipping fee. Mario Badescu products are also available in Rustan's Department Store and last time I checked the Drying Lotion sells for Php1200. 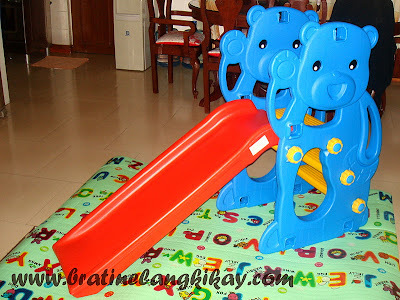 My one and a half year old toddler was in a very playful mood on Thursday night. As soon as I got home from work, I asked the nannies if the children have eaten dinner and they happily related to me how much my boy ate with gusto. 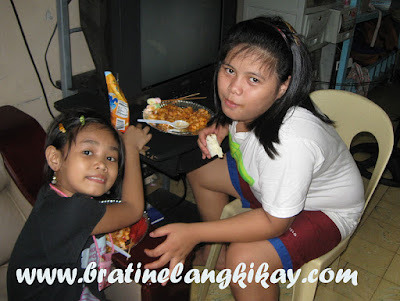 After I had a quick dinner, I took the kids to our bedroom and prepared them to go to bed. While I was changing my son crawled under the bed to retrieve a toy. I heard The Hubby called his name to summon him out and shortly after we heard a thud. We immediately checked if he was okay, especially after he came out gently rubbing the back of his head (but didn’t cry). There wasn't any lump or bulge and he looked fine. We then started playing Rio, the cartoon movie they are much fascinated to these days, as form of a pre-bedtime ritual and to settle down the very frisky toddler. Around thirty minutes later, just as the boy was dancing while watching the movie, he vomited what seemed to be all of his dinner. It got me a bit worried but thought it may be because he kept moving a lot that night. We turned off the TV, gave him milk and told the nanny to take my son to the other room and put him to sleep. Soon after, he was fast asleep while holding his milk bottle. I thought we could call it a night but to our dismay, he threw up again. I started asking the nannies what he ate and at what time. My mom then remembered he just bumped his head and vomiting is not a good sign. We decided to take him to the ER. Before we could even dress him up, he threw up again. I drove fast and on the way to Medical City, he asked for milk which he also expelled immediately. The doctors ordered a CT scan which was promptly done after they sedated my son. The initial results showed a small fracture and the doctor said they saw a 'smear' which could possibly mean a bleeding. My heart sank. I asked the doctors what will happen if there's a bleeding. They said small fractures and bleeding usually resolve on their own but if bleeding persists, he may need an operation to his head. I started to panic and my eyes probably failed to hide it because the ER doctors somewhat comforted me by saying these are unofficial results and the final reading will be done in the morning when the surgeons and specialists arrive. We were advised for immediate confinement so he can be observed. I went to the Admitting Department and learned that there's no room available. Nevertheless, I submitted my son's name for room allocation and by the look of it we will get a room by 2pm the following day (we're number 41 on the queue and wondered who will get discharged at midnight?). Luck is not on our side that night. By 4am, my son has not had a decent sleep and has become very irritable. The ER Pedia section was full of children and babies crying loudly. My poor boy, even if he wanted to, couldn't manage to doze off due to the noise. He also kept pointing to the fluorescent lights above saying, "Lights! Lights!" - meaning he wants to have the lights turned off. The whole situation of being on a full ER waiting for a room all night was surely causing my son more harm than good so I talked the doctors and asked to be released. I decided we'll come back in the morning when my son's pedia is IN and if there's a room already available, we'll have him admitted. 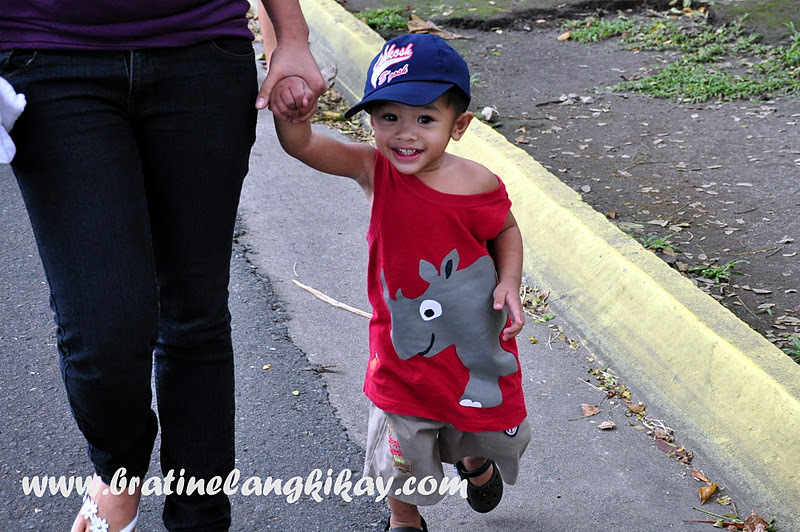 We returned to Medical City at 9am to have my son seen by his pedia. I only had an hour of sleep but as mother, I am not allowed to feel tired or weak. The first thing I did was to check the official CT scan results and they were all normal. I had to lock myself in the ladies' room as I read the report for shame of crying in public. Thank God fractured skull or head injury has been ruled out. 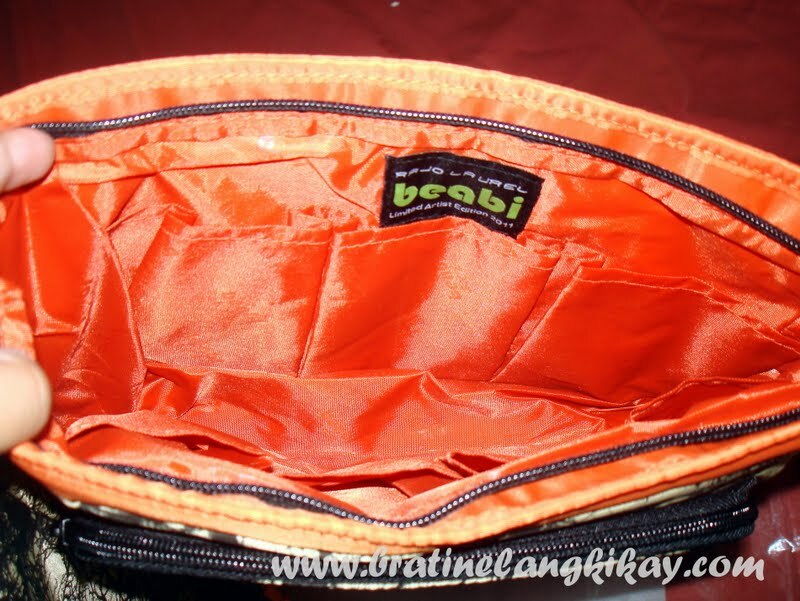 I first saw the Beabi tote bag at Chuvaness.com blog and really thought of buying. Beabi specializes in travel organizer and storage accessories, the sort of stuff a neat freak wants. Their products are definitely for someone like me who likes to keep things in order but fails all the time (jeez, it's almost impossible now with 2 kids always tugging at the hem of my skirt!). I attempted to do shopping at their online store and stopped midway after seeing I was about to check out with about 10 items. After that I've decided to delay my trip to the mall, especially to Beabi, because I am darn sure I'll buy more than what I really want and need. Anyway, Chuvaness launched an online contest with six (6) Beabi bags by Rajo as prizes. I was too busy to join and turned green when I saw the winners name. Good that I didn't sulk because suddenly I now have this much coveted Limited Edition Beabi bag designed by Rajo Laurel, no less. 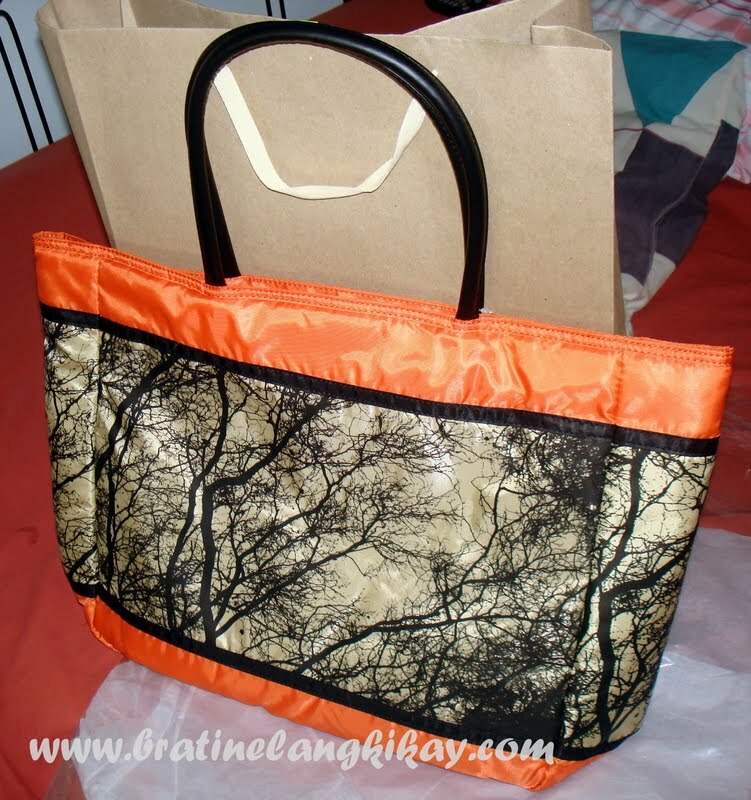 The tote bag comes with an organizer that could fit more than enough of my beauty knick knacks and other trinkets. It comes in the same designed fabric of the bag. My ever thoughtful BFF gave it to me as (delayed) birthday gift and to say I was surprised, happy and thankful is an understatement. Thanks my dearest. My social, fashion and kikay life will be in total mess without you. xoxo. 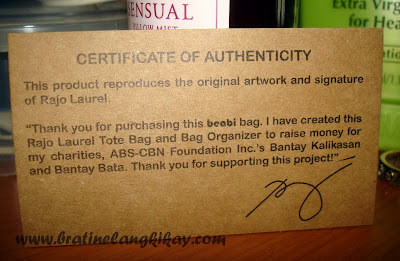 Aside from the 'plus pretty points' of sashaying around with a hip tote bag, it's good to know too that a portion of the bag sales for this particular line of designs, the Limited Artist Edition, goes to the artist's favorite charity. Beabi stores are located at Eastwood City, Greenbelt 5, Robinsons Galleria, Robinsons Place Manila, TriNoMa, SM North EDSA, SM Fairview and SM Mall of Asia. Online shop is also open and they have domestic and international deliveries. After discovering that there are over 120 varieties or Kit Kat flavors, I've been in constant hunt for new flavors that I have never tried before. Most unusual variants are from Japan and ranges from weird Aloe Vera Kit Kat to the extreme Soy Sauce flavor. 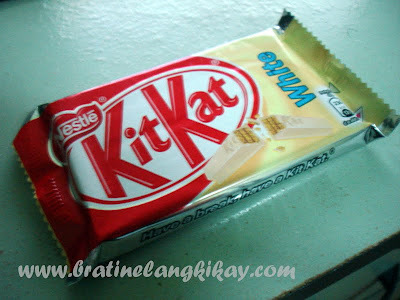 It was no surprise that they have produced a Wasabi Kit Kat and I was lucky enough to have tried it. 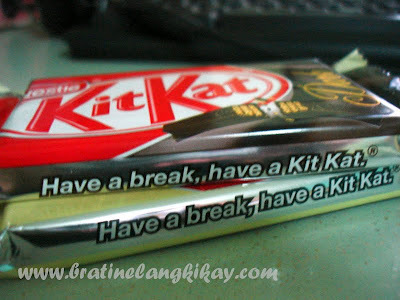 We were doing our monthly grocery for the office when I chanced upon Kit Kat Dark (in dark chocolate, I guess) and White Kit Kat from Rustan's. Naturally, I grabbed one each as even variants as common as these are not normally available in SM or other supermarkets. 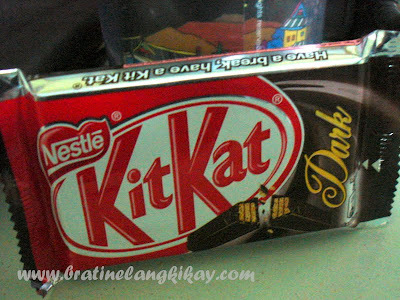 Without even opening and trying them out I was already in favor of the dark one; it is the exact opposite of my vibrant personality (hehe evil grin) but when it comes to chocolates, the darker it is, the more that I like it. I crave for the contrast of sweet and bitter - sometimes too bitter it borders to sour already. Yum. That's exactly how I like my chocolate. 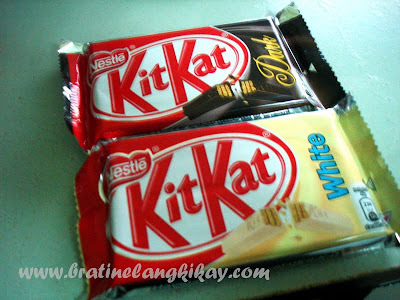 The White Kit Kat is too milky and sweet for my taste which is weird because my tolerance of sweets is relatively high. To better appreciate I ate it while having coffee so there is something bitter to counter the sweetness. I've stood as god mother to my friends and relatives' children over two dozen times but my experience last week at my nephew's christening was an unforgettable one. Catholic baptism rites are normally dragging with the priest handing out a booklet so the child's parents and godparents know the proper responses as the sacrament is administered. 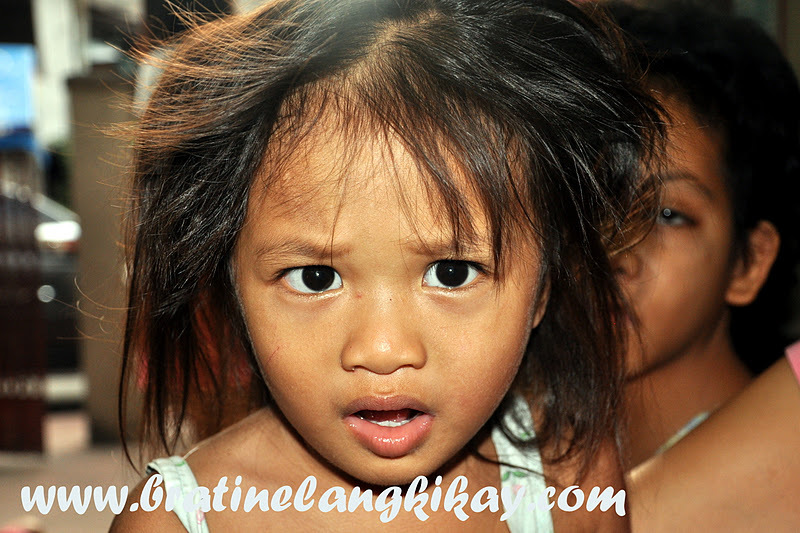 In most parish churches it involves pouring a small amount of water three times on the forehead of the infant. This is followed by a white cloth or a cap being placed over the head of the baby. The usual lighting of candles ensues at the cue of the priest. When I got to the baptism hall, I frowned at the sight of babies for baptism wearing only very casual clothes - sando and briefs to be exact, while their baptism gowns or clothes were all in hangers carried by the moms. My nephew was in his tan pair of shorts and shirt so I asked my sister why the baby wasn't wearing decent baptismal clothes. She said that was the instructions of the parish office. Weird. Anyway, the baptism rites began soon after all the candidates arrived (there were 7 that Sunday). I must commend the priest and 3 church assistants who sang, read the Bible and Gospel and organized the venue. The ceremony was not sleep-inducing and I didn't feel like being hurried and the officiating priest is just doing his duty like baptism is just a paint job that needs to be finished. I actually felt part of the baptism ceremony. After the usual anointing of oil, the lector asked the babies to be stripped down to their birthday suit. Whoa! That's when we realized the 'wisdom' behind the instruction to have them wear their gown after the baptism. After baptism meaning after they were bathed ala laundry way. There were lots of forced laughter mixed with nervousness from parents and relatives of the babies being baptized. Come to think of it, when we give bath to our babies we're all careful not to pour water over their eyes and noses - but hey Father Whoever just dip the babies into the water as if rinsing a dirty piece of cloth. During the days of early Christianity, baptism is done near a body of water (normally a river) where the candidate is immersed in the water. Sometimes the candidate kneels down while water is poured over his/her head. Immersion or submersion are the key words - but during that time people who are being baptized are grown ups, probably way beyond their teens, hence, they could be immersed, submerged, thrown, drowned into the river. Honestly, I like the baptism ceremony at the National Shrine of Our Lady of Lourdes (or Lourdes Church for short). If I could bring back the hands of time, perhaps I'd have my children's baptisms there (that is if The Hubby will not object). For inquiries, you may call the Parish Office at 731-9306, 740-8878. 1. 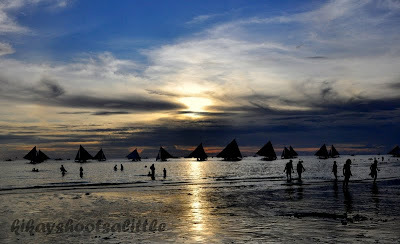 We were in Boracay for 3 weekdays so there were classes ongoing. We come across these kids walking towards home after school at about lunchtime. 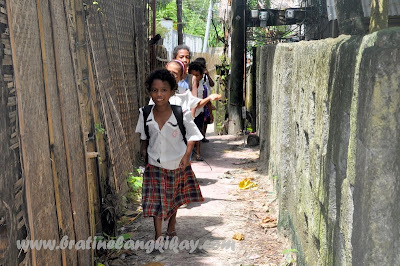 The children look very native, probably decendants of the Ati tribe who are first settlers of Boracay. 2. We Pinoys possess a lot of creativity even in naming our businesses. 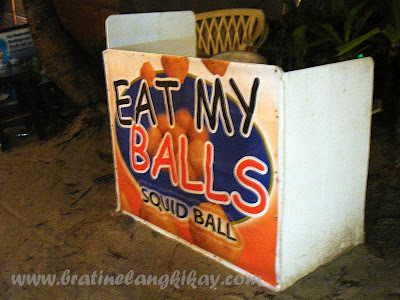 Fine, go Eat My Balls! (but I ain't gonna eat yours haha). 3. Everyone wants a slice of pie from the tourism industry in Boracay so even in the most narrow eskinita (alley), someone will put up a business. I like how a translation is included in the signage. 4. 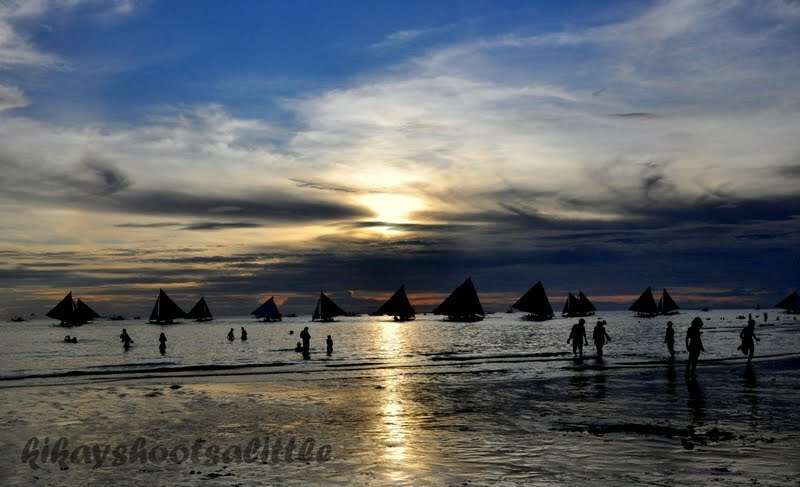 Meet a typical Korean lady in Boracay. She's all dressed up as if going to a party or the mall. It's crazy how she struggles with her heels sinking into the sand as she walks. The guy in red is a boatman probably offering island hopping services or 'friendship' (someone told us some boatmen are able to date Korean tourists. Oh yeah!). 5. Just when I thought I've seen it all in Aklan through Boracay, I went to a toilet in a restaurant in front of the Kalibo Airport and saw this. Who are these for? 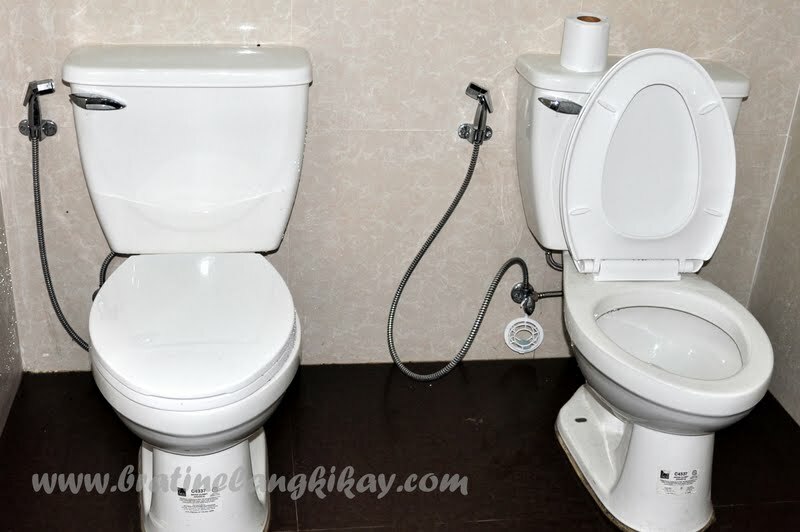 Two amigas who are too engrosed in their gossips and can't separate even for a brief 'break'? Lovers who take the word inseparable to the highest level? If I were to count all my close friends that are single and unattached to this date, my fingers and toes will not be sufficient. I know they want to strangle me when whenever we meet up or talk I almost instantly would ask if they are seeing someone and immediately wants to play match maker. I don't mean to be nosy and I truly understand some people are really meant to live a life of self pampering, independence and freedom from a nagging partner (haha, this isn't how I feel about my married life just to set the record straight) but what is it in a relationship that makes beautiful, intelligent and good people shy away? A childhood friend once told me she just doesn't know where to find a decent man and so I asked, what is Decent so we can figure out where Decent hangs out or where Decent lives. Then someone suggested she hones the magic of the internet as Decent may be out there somewhere to which I snorted, ‘you mean, just like doing online shopping?’. Back in the 90s, before internet became a boom and cellular phones are affordable only to the rich and famous, people in the dating arena have pen pals - a courtship process that flourish through snail mail. One writes a love letter, troops to the post office, buys a stamp and off the letter goes to the waiting lover 5 to 10 days later. Patience is a virtue, definitely! Fast forward to today, the proliferation of social networking sites make it easy to 'meet' someone. Gone are they days when one would have a 'pen pal' (why, my 20 year old cousins doesn't even know its meaning), instead, online dating is the name of the game. 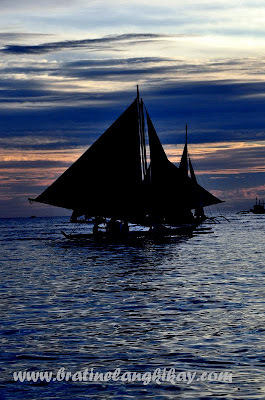 As long as one is connected to the internet, one can chat the night away with a person thousand miles from another side of the world. Several websites and online forums also offer personality matching services, tips on getting laid (believe it or not!) and organize dating parties. I've heard a couple of success stories through these methods, although a lot of people still want to play safe and succumb to their doubts and reservations. The downside of online dating and similar sites is they are now becoming increasingly popular to scumbags who want to snag more than just a date or tips on getting laid. Because as quickly as one is able able to find a date is the same ease of creating a fake account attached with a photo of someone else. Create 10 email addresses and you can have the same number of Twitter and Facebook accounts too! So just like doing online shopping, finding someone through the internet involves taking a lot of browsing, searching, and caution. Don’t grab the first ‘item’ only because it is on Sale.